Michele has worked for the City for 30 years. She has been in her current position as an Accounting Technician with Parks and Rec in the City Hall Annex for 26 years. She loves working for Parks and says her co-workers are an “awesome group.” Her commitment to walking daily on her lunch break began shortly after she came to the Annex when her supervisor invited her to join her on a walk through the skyways. Her supervisor has left the City but Michele has continued her daily, 30 minute walking lunch breaks ever since. In 2000 Michele’s sister, Diane Schwanke, began working for the City as a Payroll Specialist. She readily joined Michele in her daily walks. Michele says she feels like the luckiest person in the world to be able to get in her exercise while spending quality time with her sister. In the summer months, they enjoy a brisk, two mile walk outside. In addition, they designated certain nights during the week when Michele will get on her elliptical at home and Diane on her treadmill. For accountability, they report back to each other the next day. Heart disease runs in Michele’s family. She became borderline hypertensive and did not want to go on medication. She opted instead to get healthier by eating better and adding additional exercise. She joined the Omada program in November, 2017. This has worked tremendously for her as she has lost 20 lbs. since joining. She likes being able to bounce off thoughts with her core Omada group. She really appreciates the support they and her coach provide. Michele thinks the lessons, while often things you already know, serve as a good reminder and motivation to incorporate them into your life. She likes the accountability Omada provides as well. She is eating so much better and feels great since joining. For people whose job like Michele’s involves sitting all day, committing to getting up and moving is important. She loves that her Fitbit reminds her with a buzz when she hasn’t moved out of her seat for an hour. Since joining Omada, Michele has added walking the Annex stairs on her morning and afternoon breaks. She started inviting co-workers to join her and now about five of them often will. She invites everyone to give it a try. It provides a mental break as well as some exercise. Any day Michele doesn’t get in a walk now feels like a really long day to her. She recommends people get up and walk as it actually can be reenergizing. Regarding Omada, she tells anyone who is considering it not to hesitate. While it is a commitment, anybody can do it. It is a fantastic program and she feels so much better having participated. 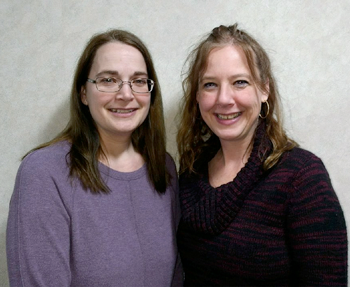 PHOT0: Michele Lamere (right) with sister, Diane Schwanke. we will publish a Q&A in a future issue. Change happens one step at a time!